It started when Geary was looking at tax forfeited properties in Sawyer County. Many of the properties he had been viewing possessed little to no timber value. He was ready to head home when a piece of landlocked woods only legally accessible by river caught his eye. Closer inspection revealed impressive glacial features including eskers, erratics, and a bubbling, cold water stream. Geary fell in love with the property so much that he rushed to the county offices before they closed to put in a bid, as they were due that afternoon. Since cell phones didn’t exist then, the tight timeline meant Geary hadn’t had time to consult with Kay before placing his bid. She wasn’t exactly thrilled about the idea of being left out of a major finical decision. She was even less thrilled when it turned out their bid had won. Geary promised Kay they could sell the land if she didn’t like it, but appealed to have her spend a day exploring the property with him first. She ended up falling in love with the property just as Geary had, so they acquired an additional piece of land to secure road access, and the rest, as they say, is history. Geary is a charter member of WWOA. He first heard of the organization as a newly graduated forester working with another forester at his consulting firm. His boss received notice of a meeting and decided it would be worth their time to check out. Over the years, Geary has been an active member. 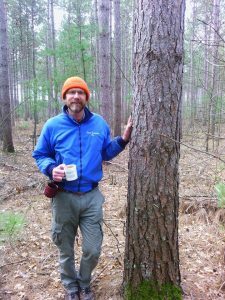 He writes the occasional article for Wisconsin Woodlands magazine, typically relating to his specialty of taxation on forestry investments. More recently he was part of the planning committee for the 2017 Annual Meeting in Cable and led the canoe trip down the Namekagon River. The Annual Meeting is probably Geary’s favorite WWOA activity. He enjoys the social aspect as well as learning what others are doing on their land. He would much rather interact with other landowners and hear about the activities they’re doing in their own woods than read a book or magazine when looking for new ideas to try out in his woods. Additionally, he recommends new members go to a local chapter meeting or Annual Meeting. Sit at a table where you don’t know anybody, and you’re guaranteed to learn something new, he said. One of Geary’s favorite activities is to spend time in his woodlands whether it be walking, skiing, or snowshoeing. It is much more fulfilling to recreate in the results of his labors than if they were being stored in a filing cabinet or on the hard drive of a computer. He daily gets to take in one of his projects of converting part of his northern hardwoods from a mostly even-aged stand to something more uneven aged since it is along his driveway. The view never gets old. He also likes to muse that 100 years from now, someone might come along and have a picnic under one of his large white pines. They won’t have the slightest idea that Geary planted the tree instead of nature, but they will enjoy the view and experience just the same. It’s part of his legacy that will be lasting even after he is long gone. Anytime Geary is away from home for even a few days, he feels how lucky he really is. The water on their property runs clean instead of chocolate brown, he can sit on the porch and hear the noises of nature instead of the hum of cars and trucks, and the sky overhead gets dark at night. His daily experience is something he’s truly fortunate for. “I may not have much, but I have something most people don’t,” he said.